This organ forms an important part of the impressive new Music Centre at Cranmore School, in West Horsley. Having been consulted at an early stage in the design of the Concert Hall, we were able to work closely with the architect and customer to the significant benefit of both hall and organ. 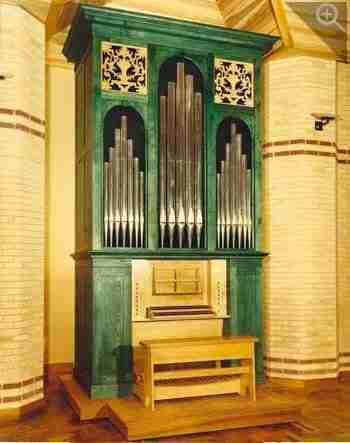 Space being limited, a special niche was provided for the organ, from which it can easily be wheeled forward when required. The organ has been conceived as a versatile teaching instrument as well as for use in ensemble, and in the accompaniment of the daily assembly. In spite of its modest size, it has proved more than capable of its task in introducing young musicians to the organ, as well as broadening the experience of the music staff of the school. The Great Organ occupies the lower part of the case, with the Swell Organ above - the swell shutters being immediately behind the display pipes. The Pedal stop is accommodated in the base of the case, the lowest notes standing immediately outside the panelling at the back. The layout of the organ lent itself particularly well to "suspended" action, which has been applied to both of the manual departments. In spite of the limited space, the pipework is planted in major thirds, which enhances the tuning and blending qualities. Each department has been provided with two adjustable composition pedals. The casework, designed by ourselves, makes a focal point in the hall, the colour being picked up elsewhere in the room to good effect.